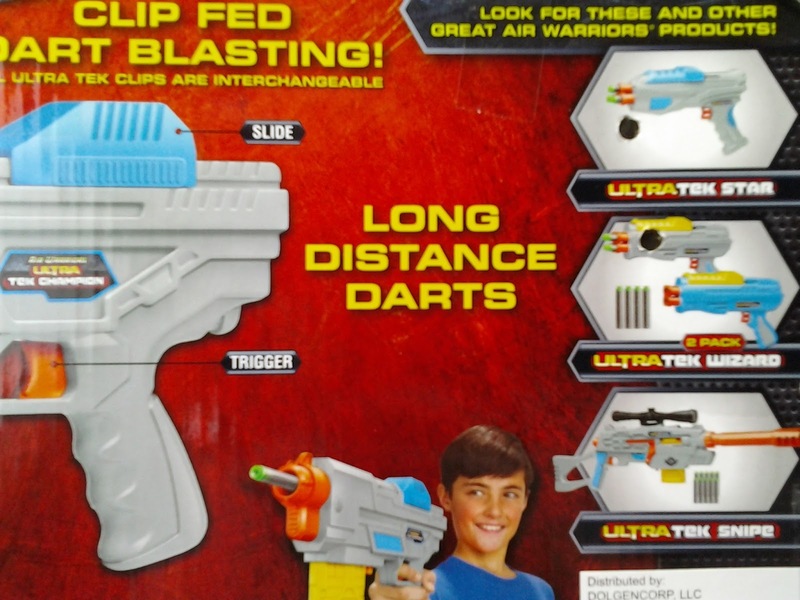 Before we examine the blaster, let's glean some information from the packaging! On the back of the package, we see three other blasters in the Ultra Tek line pictured: the Star, the Wizard (which comes in a two-pack), and the Snipe. The Star has three barrels, and the wizard has four. Since Hasbro has the patent for Smart ARs, I assume these are either manually-operated turrets, or an alternate mechanism redirects airflow within the shell. The Snipe is a bolt action, magazine-fed blaster. Whether it too is a springer or a Range Master with a magazine is unknown at this time. Here is a dart comparison chart, showing BBT's darts. Also shown are the UPC and item numbers. Now for the blaster itself! It's rather straightforward, with a charging handle at the top, an 8-dart magazine, and an adequately-sized grip. The styling and colors belong to some kind of 1980s action movie, in my opinion. Robocop, perhaps? 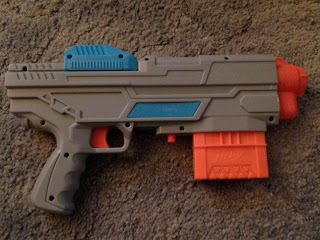 The plastic seems sturdy enough, but still feels cheaper than you'd find on a Nerf blaster. Also of note: the mag well and associated parts are essentially the same as those for Nerf. 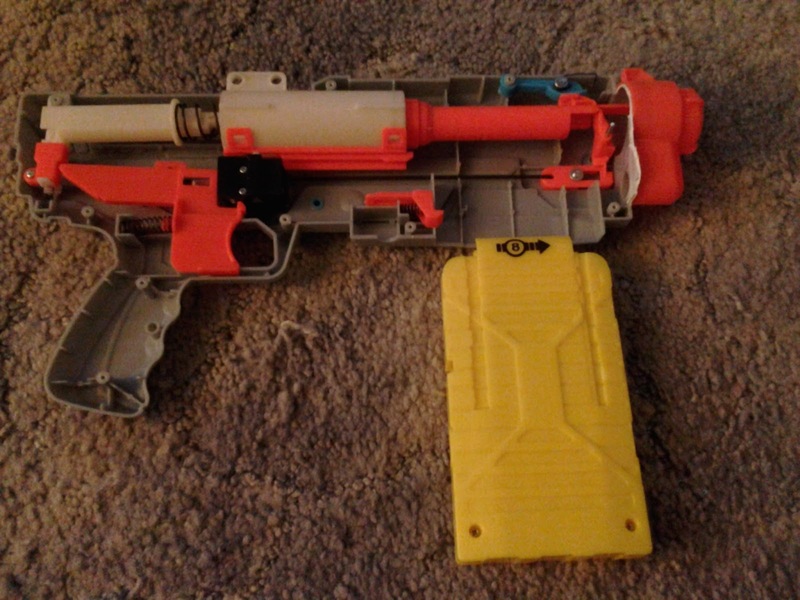 So you can still use your Nerf magazines! 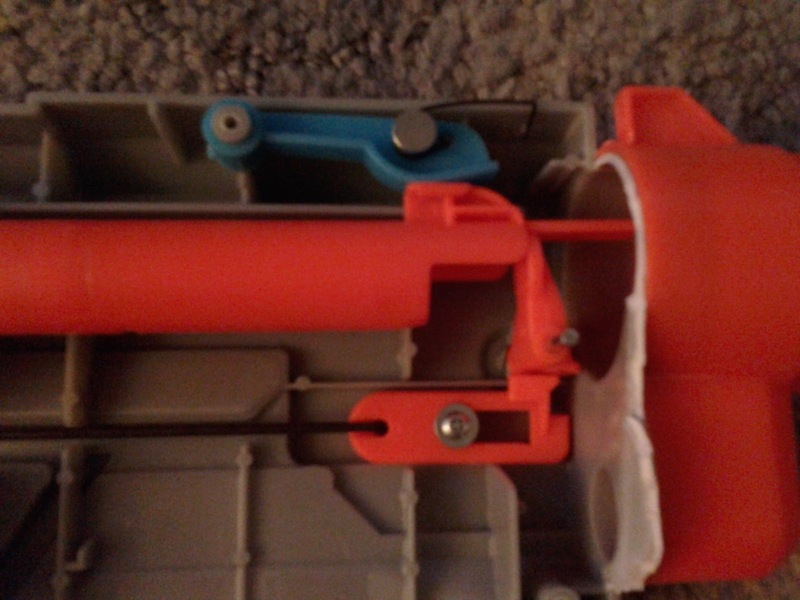 Inside the blaster, we have a 1 1/8" ID plunger tube, which shuttles hack and forth during priming. The plunger setup is essentially a scaled-up version of the one that exists in the Buzz Bee Jaguar, if you're familiar with that blaster. There's a sled on the underside of the plunger tube, and a black box with a few spring-loaded pieces. This is the safety that keeps you from pulling the trigger while priming, or from trying to prime an already-primed blaster. 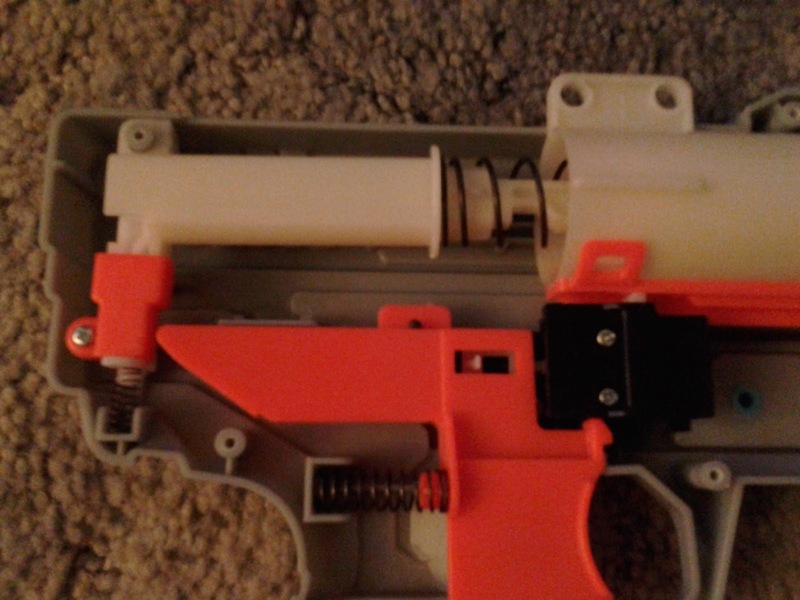 At the front, we have a dart stop for loading the breech, which swings out of the way when you pull the trigger. The blue lever puts pressure on the breech in the forward position, and appears to be this blaster's method of keeping it in position without permanently locking it. Now for the new darts! 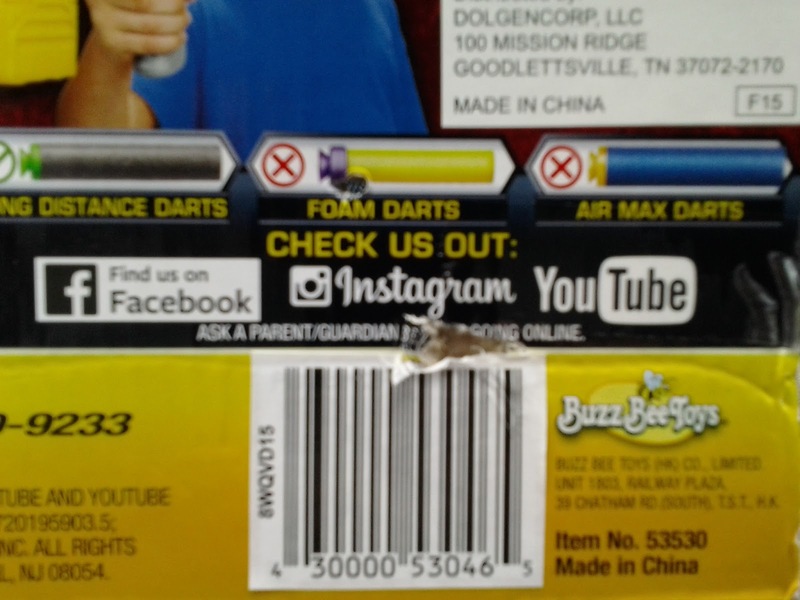 They are Buzz Bee Toy's version of mag-compatible suction darts - same dimensions as Nerf darts. 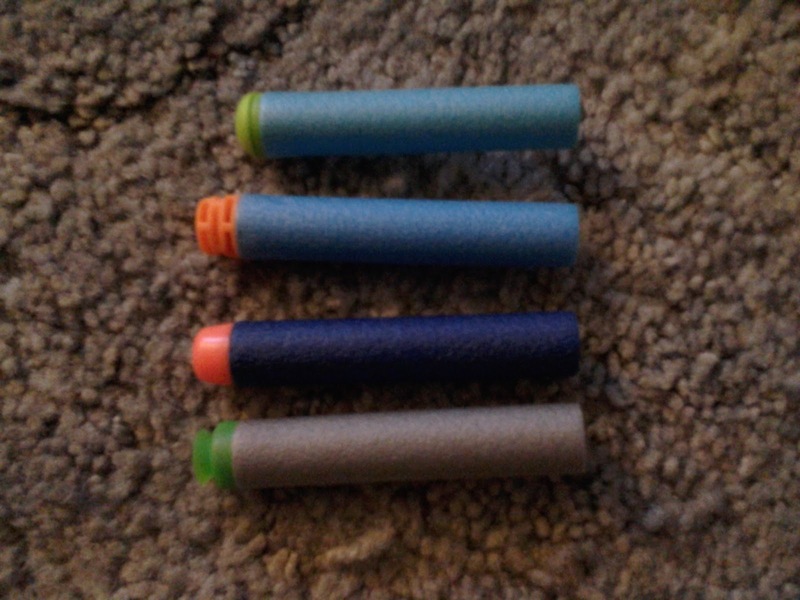 I show a Nerf Elite streamline, a K'NEX dart, and an Xshot Excel dart for comparison. Finally, we have blaster performance to document! Outside, regardless of magazine used, ranges averaged 51' flat and 83' ranged, with very close dart groupings. 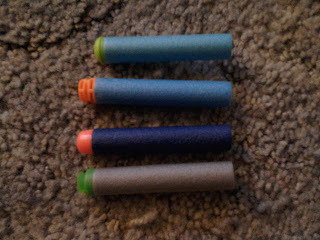 So these darts are at least accurate when used with stock blaster power. Using my chronograph and several dart types, the Champion consistently delivered fps readings in the high 70s, with 77 fps being the average. All said, the Champion has me excited for the rest of the Ultra Tek line. It can use Nerf darts and magazines, not just its own. The performance is competitive with the current crop of Nerf blasters, with lots of modding potential. And at only $10, it's a steal. 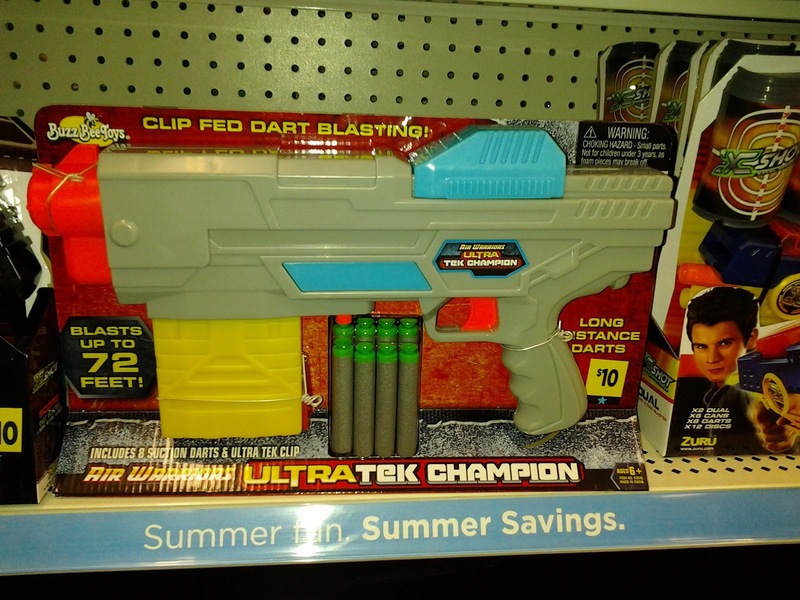 I have to give it high marks, and congratulate Buzz Bee Toys on joining the rest of the blaster market in longer-range products. Thanks, Buffdaddy! I just passed on this the other day not being impressed by its appearance. Costing only $10 & achieving high praise from you, how could I go wrong? It's now on my list. 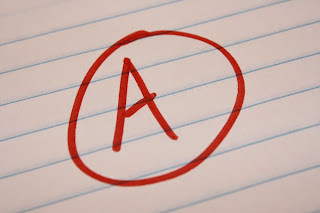 Thank you for pointing out that buzzbee insin''tttt a;wayysysys extremely bad. I just have bad experiences. 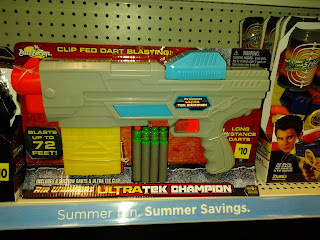 One time I had a buzzbee hunter (asuming that you know what blaster this is), and when I cocked it in a game, the bolt ripped out. AAAAAAAAAAAAAARRRGHHGGHHHHHHHG!!!!!!!!!!!!!!!!!!!!!!!!!!! 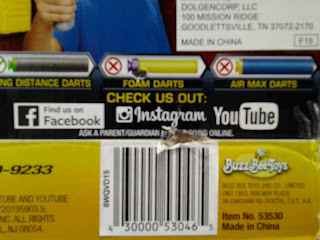 This happened with a buzzbee predator too.